NND: New neck day...solid rosewood! Discussion in 'Guitars in General' started by VaughnC, Apr 20, 2016. So, I've kinda been looking for a guitar project to fool with lately and, a week or so ago, I received an email from "Stratosphere" stating that they just received a batch of solid rosewood, chunky Strat necks from AllParts. Chunky "U" profile, 10" radius, and top loaded trussrod (so no skunk stripe)....WOW, I thought that this just might make for a cool Strat upgrade project. So, I ordered one and thought it might look cool on the coral parts-o-caster I built about 2 years ago. When the neck arrived, I leveled & recrowned the frets and installed a polished brass nut...which looks great against the dark chocolate color of the rosewood. archey, swa, StevenO and 17 others like this. Love it! Beautiful rosewood neck and beautiful coral Strat body. It's actually one of those USA gold colored dollar coins I inlaid in the pickguard just to say I built it myself in the USA . 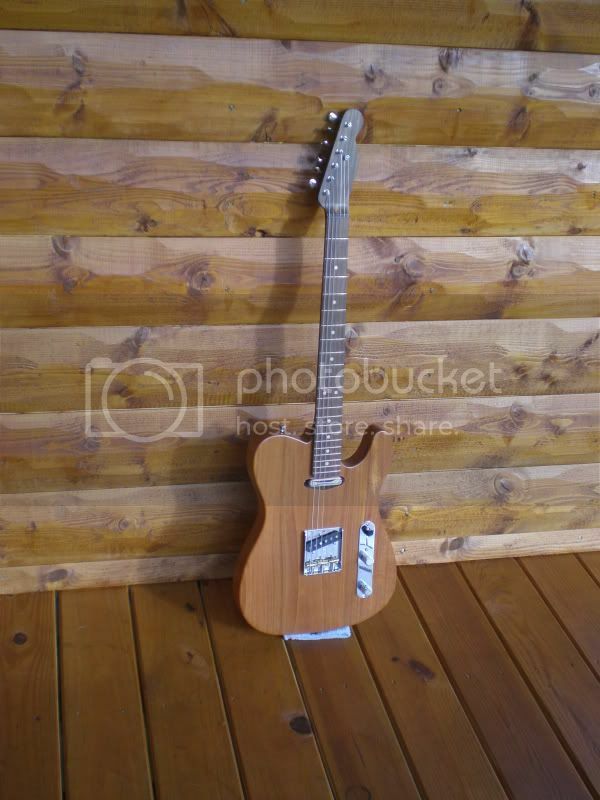 Telechamp and Torren61 like this. Stiffer than any quartersawn maple neck, right? I guess these are stiff enough. I haven't touched the truss rod adjust in my Warmoth East Indian (canary skunk stripe) Rosewood neck in 7 years. Looks fantastic! If it doesn't smell like cat pee, that's even better! I think wood varies piece to piece...so I'm not sure how to gauge it. I guess time will tell how stable it is . It was just a fun project! I have a rosewood necked McCarty, it took me a while to get acclimated to the stiff feel and faster attack. It is such a lively neck, I was surprised! Wow. That is a GREAT color combo. e??? and Telechamp like this. I built a warmoth with a rosewood neck (avatar), and it's insanely great feeling. Just remember to use lemon oil all over it relatively occasionally or it'll smell like cat pee on your hand. I've never been big into the idea of a solid rosewood neck, but I think that looks great with the coral body. You probably haven't seen my posts on oiling rosewood. I'm a non-believer after some of the refret nightmares I've experienced with oiled rosewood...so my personal rosewood never get touched with oil unless I forget to wash my hands after eating french fries . Thanks...I was thinking about repainting the body shell pink but, now that I see how the coral looks with the dark rosewood, I may leave well enough alone...but maybe not . Hey, how would you judge the sound with the RW neck compared to maple necks or maple/RW? One of the nicest necks I ever played was a all rosewood on a PRS 513. Soooo smooth. In the past, I've owned a few solid rosewood neck PRS and, IMO, rosewood seems tonally less consistent than maple...and I think it's related to how much natural oil content is in the individual piece of rosewood it's cut from. However, this particular neck seems to impart slightly stronger mids compared to the maple/rosewood neck it replaced. Can't say its tonally better or worse, just different. But, the feel of that raw, unfinished rosewood in the palm of my hand makes for an intimate playing experience...I sort of feel more of a connection with the guitar, if that makes any sense . Boris Bubbanov and zztomato like this. Yeah, natural variation might explain a lot of what guys have found. I did a bunch of things to rein it in. d) I tried every pickup set I had until I found the best match. I did the unspeakable. I actually grain filled this rosewood, with Bartley's. Then I sealed in the grain filler with 2 super light applications of Minwax Tung Oil Finish (similar to Tru Oil). Still feels great. Just never smells funny as you play it too much. 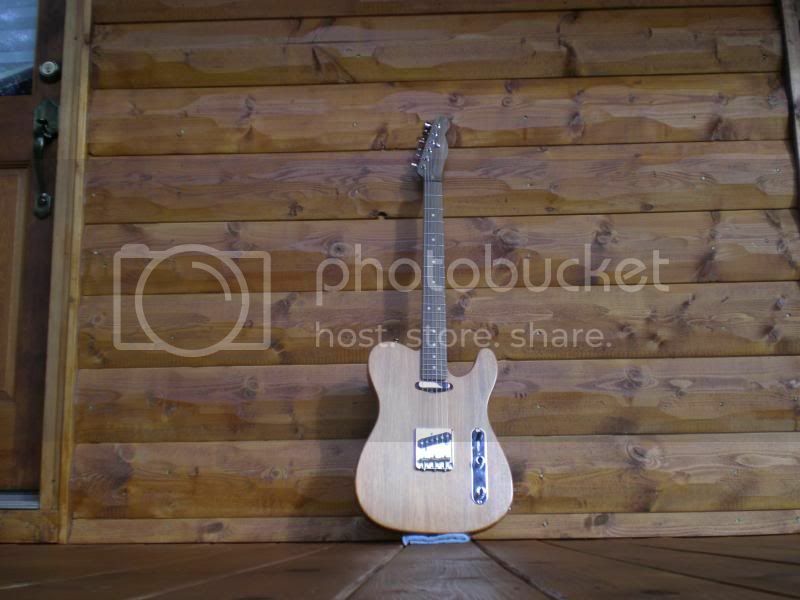 Nice Tele! Yup...that's why I might not pair a RW neck with a Tele as Tele's are inherently bright to begin with. Luck of the wood draw though, I suppose. Seems like with a Strat you're not fighting the guitar's natural tone as much. But, then again, I guess that's part of the "fun" building a guitar...you just don't know what you're going to end up with until that first note is played . I also have the Fender limited edition version of a solid rosewood neck Strat they made in 2015 and it does sound similar...but the neck on the Fender is much slimmer, which could be good or bad depending on the paws involved. However, now that I have the chunky "U" profile neck on my parts-o-caster, I'll probably sell the Fender as I have rather large paws and the parts-o-caster feels better in that regard.